Background: Mucins are high-molecular-weight glycoproteins with a high O-linked carbohydrate content, which are synthesized by many secretory epithelial cells as membrane-bound and/or secreted products. Mucin-1 (MUC1) is a transmembrane mucin that protects and lubricates the mucous membranes of the human body and involves itself in various cellular functions such as growth, differentiation and signaling. An aberrant expression of MUC1 has been demonstrated in various human cancers. Many studies on MUC1 expression have been conducted on a variety of neoplastic lesions other than head-and-neck region. In this study, an attempt has been made to evaluate the MUC1 immunoexpression in oral squamous cell carcinoma (OSCC) and normal oral mucosa (NOM). Aims: This study aims to compare and correlate the immunoexpression of MUC1 in NOM and OSCC using immunohistochemical technique. Settings and Design: Thirty patients of OSCC formed the study group and thirty patients were included in the control group (NOM). Formalin-fixed paraffin wax blocks were prepared from the tissue samples obtained. Materials and Methods: Immunohistochemistry (IHC) for MUC1 was performed, and the overall percentage of positive cells along with distribution and localization of immunoexpression was studied. Statistical Analysis: Pearson's Chi-square test was used. P <0.05 was considered to be statistically significant. Results: In OSCC study group, MUC1-positive immunoreaction was observed in 21 (70%) cases out of 30. All the samples in control group were negative for MUC1 immunoexpression. The immunohistochemical expression of MUC1 in OSCC group was statistically significant when compared with normal control group, as P < 0.05 (Pearson's Chi-square). Conclusions: MUC1 is a reliable biomarker for the diagnosis of OSCC, but further studies are required to prove its role in prognosis. Neoplasms of diverse cellular origin usually arise in the oral cavity, and among these, the oral squamous cell carcinoma (OSCC) and its variants constitute over 90% of the oral malignancies. Globally, overall, oral cancer has been reported as the 15th most common (male and female) and 11th most common cancer in men. However, there is a significant difference in the incidence of oral cancer in different regions of the world, with the age-adjusted rates varying from over 20/100,000 population in India to 10/100,000 in the USA and <2/100,000 in the Middle East. In comparison with the US population, where oral cavity cancer represents only about 3% of malignancies, it accounts for over 30% of all cancers in India. According to the data extracted from GLOBOCAN 2012, oral cancer in India ranks third among all types of cancer in terms of incidence and mortality although it stands first among the males and fifth among the females. Thus, it becomes important to diagnose OSCC as early as possible (primitive stage) so that early intervention reduces patient morbidity and increases survival rate. In the past, various researches have been done to understand the pathogenesis of OSCC at molecular level so that it can be diagnosed early. The knowledge that has accumulated on the fine regulatory mechanisms of molecular alterations in cells undergoing malignant transformation promises development of tumor markers that can detect cancer in its early phase, thus helping in finding new treatment modalities and more accurate assessment of prognosis. This study was conducted to evaluate and compare the expression of mucin-1 (MUC1) in normal oral mucosa (NOM) and OSCC. Individuals willing to participate in the study procedure with written consent. Individuals unwilling to participate in the study. Individuals with no habit history tobacco, betel nut, alcohol. The study protocol was approved by the Ethics Committee of our hospital. Thirty randomly selected patients of OSCC were clinically grouped using tumor, node and metastasis (TNM) classification., Hematoxylin and eosin (H&E)-stained slides were examined and the histopathologically diagnosed cases of OSCC were scored as per the criterion given by Bryne et al. in 1991. The tumor invasive front was excluded as the specimens were obtained from incisional biopsy. The scores were calculated for each H & E-stained slide and prognosis was determined. Thirty patients were included in control group that comprised healthy volunteers (NOM obtained from crown-lengthening procedure and third molar/impacted tooth removal surgery). Three- to four-micrometer thick formalin-fixed paraffin-embedded sections were dewaxed in xylene and hydrated with graded ethanol, and then, the slides were kept immersed in distilled water for 5 min. The slides were placed in a metal slide rack, which, in turn, was kept in a pressure cooker containing boiling antigen retrieval solution for antigen retrieval. The pressure cooker was then sealed and brought to full pressure. The pressure cooker was allowed to cool down to room temperature with the slides remaining in the buffer itself for 15–20 min. Endogenous peroxidase was blocked with 3% H2O2 for 10 min. The slides were gently washed with Tris buffer and placed in the humidity chamber (buffer bath) for 5 min. The excess buffer on the slides was tapped off and covered with power block for 10 min. The power block solution was not washed with Tris; instead, it was gently tapped off the slides. The sections were covered with primary antibody (Rabbit Monoclonal Antibody MUC1, BioGenex Life Sciences Pvt. Ltd.) for 1 h. The slides were then washed gently with Tris thoroughly twice and kept in the Tris buffer bath and covered with super-enhancer for 30 min. Then, sections were incubated with secondary antibody for 30 min followed by two consecutive buffer washes, each for 5 min. Horseradish peroxidase was added to the sections and incubated for 30 min. The chromogen diaminobenzidine was prepared just before use by mixing one drop of chromogen to 1 ml of buffer in a mixing vial and later added over the sections. After 5 min, the sections were washed in buffer followed by water and counterstained with hematoxylin, air dried, cleared and mounted with dibutyl phthalate in xylene. Breast carcinoma specimen was used as positive control. The stained sections were scanned under low power to determine the area that stained brown color against a blue background and was considered as positive for MUC1 immunoexpression. Cytoplasmic and/or membranous staining was considered as positive immunoreaction for MUC1., The staining pattern in breast carcinoma was used as the standard to interpret the study sections. The immunohistochemistry (IHC) stained slides were graded positive or negative as follows: negative if <5% of the cells were immunopositive and positive if >5% of the cells were immunopositive. Further grading of positive immunoreaction was done as follows: Grade I: 5%–25%, Grade II: 25%–50%, Grade III: 50%–75% and Grade IV: 75%–100% immunopositive cells. Furthermore, correlation between the grades of immunoexpression with clinicopathologic parameters was evaluated. Other factors such as staining intensity, distribution (focal or diffuse) and localization pattern (cytoplasmic or membranous or both) of IHC-stained slides were also evaluated. All IHC-stained slides along with the corresponding H & E sections were analyzed by two observers. Pearson's Chi-square test was performed to analyze the expression pattern of MUC1 with various disease parameters. The results were considered statistically significant when P < 0.05. The study comprised 30 cases of OSCC, out of which 26 were well-differentiated OSCC (WDOSCC), 3 were moderately differentiated OSCC and 1 was poorly differentiated OSCC. The study group comprised 23 males and 7 females with age ranged from 24 to 75 years with a mean of 49.4 years. Most of the patients affected belonged to 40–60 years of age group [Table 1]. Distribution of OSCC according to the site is shown in [Figure 1]. In the OSCC study group, MUC1-positive immunoreaction was observed in 21 (70%) cases out of 30 [Figure 2] and [Figure 3]. 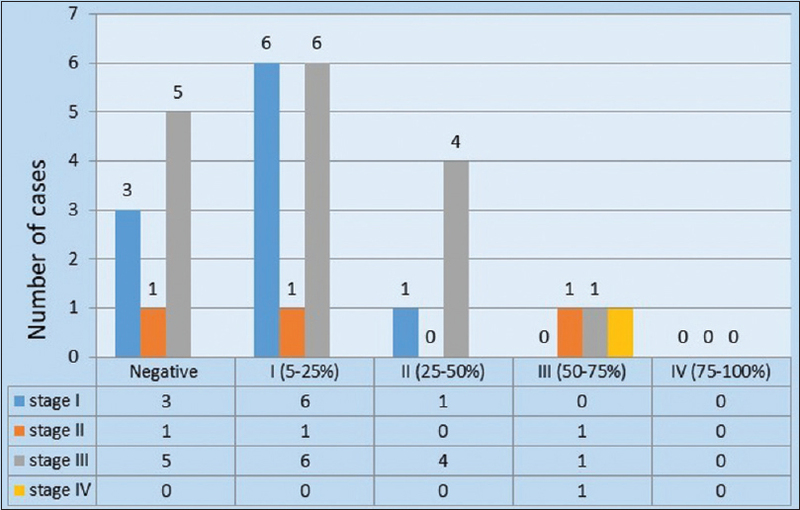 On the basis of immunohistochemical grading, 9 (30%) were negative, 13 (43.33%) were Grade I, 5 (16.66%) were Grade II and 3 (10%) were Grade III positive [Figure 4]. Furthermore, 16 (53.33%) cases of OSCC study group showed MUC1 subcellular localization both at cytoplasm and membrane level, while 5 (16.66%) cases showed only membranous staining [Figure 3]. In WDOSCC, the keratin pearls also showed immunopositivity for MUC1 [Figure 3]. Among the 30 cases of OSCC, 9 (30%) cases showed immunoexpression of mild intensity, 7 (23.33%) cases showed strong intensity and 5 (16.66%) cases showed moderate intensity. All the samples within control group (normal tissues) exhibited negative immunoexpression for MUC1 [Figure 3]. Statistically significant correlation was found between the MUC1 expressions in control group and OSCC study group, as P < 0.001 (Pearson's Chi-square.) No statistically significant difference was found between the MUC1 expression and different clinical stages of OSCC nor between the different histopathological grades of OSCC, as P > 0.05 (Pearson's Chi-square) [Figure 4] and [Figure 5]. Recently, new markers such as mucins have been studied in the various cancers such as breast cancer, pancreatic cancer, upper respiratory tract cancer, esophageal cancer and also oral cancer.,,,,, Mucins are high-molecular-weight glycoproteins that play a major role in cell growth, differentiation and cell signaling. The cancer cells use mucin for cell proliferation, survival, invasion, metastatic growth and protection against innate immunity., Among various mucins, expression of MUC1 transmembrane has been extensively studied in various types of tumors. MUC1 was first identified in the milk fat globule membrane fraction and is described as a protein rich in serine, threonine, proline, glycine and alanine. MUC1 is a transmembrane glycoprotein with an extracellular domain consisting of a variable number of highly conserved tandem repeats of 20 amino acids, a transmembrane domain and a cytoplasmic tail of 69 amino acids. In cancers, MUC1 is often overexpressed and alters glycosylation, resulting in exposure of the core protein of the tandem repeat region., MUC1 expression and alterations in glycosylation are associated with the development and progression of malignancy., Therefore, mucins can be used as valuable markers to distinguish between normal and malignant conditions. In this study, out of 30 cases, 21 (70%) were immunopositive and (30%) 9 were immunonegative for MUC1. All the control group samples showed no immunoreactivity to MUC1. Overexpression of MUC1 in OSCC study group compared with NOM was seen. A statistically significant correlation between the MUC1 expressions in control group and OSCC study group (as P < 0.001, Pearson Chi-square) was seen. This suggests the role of MUC1 in the pathogenesis of OSCC. Our findings are in accordance with the findings of Nitta et al. 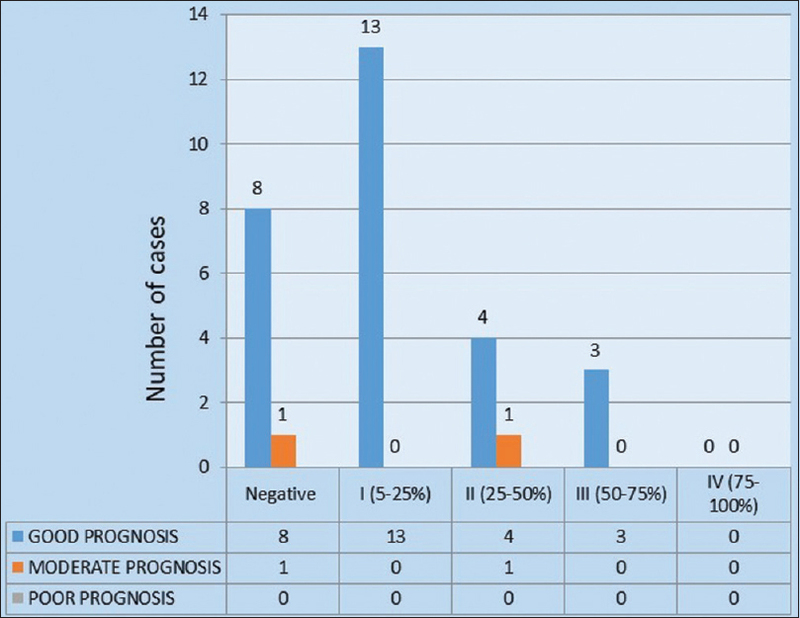 In their study of 77 OSCC cases, 46 cases (59.7%) were MUC1 positive. Furthermore, Kumar et al. in their study noted an increased expression of MUC1 in OSCC cases compared to normal tissue, and all 20 cases showed positivity for MUC1. Croce et al. studied MUC1 core protein and carbohydrate-associated antigens in head-and-neck carcinomas. Out of 29 samples, 24 showed immunopositivity for MUC1. They also found that MUC1 was expressed at varying levels, usually in keratinizing foci along with subepithelial neoplastic cells. Hamada et al. studied immunohistochemical expression of DF3/MUC1 in OSCC tissues from 206 patients. Positive staining (>5% of cells stained) of DF3/MUC1 was observed in 80 OSCC cases (38.8%). In addition, aberrant DF3/MUC1 expression was found to be a significant risk factor for subsequent regional lymph node metastasis. However, no statistically significant correlation was found between the MUC1 expression and different histopathological grades of OSCC, as P > 0.05. Based on clinical TNM staging, out of 30 cases of OSCC, the lesions were predominantly found in Stage III (16, 53.3%), followed by Stage I (10, 33.3%), Stage II (3, 10%) and Stage IV (1, 3.3%). There was no statistically significant difference of MUC1 expression between the different clinical stages of OSCC (as P > 0.05). Similar results were seen in a study by Nitta et al. However, positive associations between expression of MUC1/DF3 and clinicopathologic characteristics were found in the study by Hamada et al. They concluded that overall aberrant expression of DF3/MUC1 was found to be strongly associated with tumor aggressiveness in patients with OSCC. In their study, the percentages of patients with positive lymph node metastasis, advanced tumor stage, diffuse invasion of cancer cells and vascular invasion were significantly higher in the DF3/MUC1-positive group compared with the DF3/MUC1-negative group. In the present study, the immunoexpression of MUC1 subcellular localization was present at cytoplasm as well as at membrane level in 16 (53.33%) of the 30 cases. Five (16.66%) cases showed only membranous staining. The MUC1 localization was found in tumor cells and at the level of adjacent dysplastic epithelium. The immunopositive cells were mainly seen in basal and parabasal and sometimes in the entire epithelium. In WDOSCC, the keratin pearls also showed immunoreactivity. Similar findings were seen in studies by Nitta et al. and Kumar et al. The membranous and cytoplasmic staining of MUC1 in the squamous cells might be related to MUC1 structure. MUC1 consists of extracellular domain of tandem repeat array, a transmembrane domain and a cytoplasmic domain. This cytoplasmic domain is responsible for cytoplasmic staining., The immunoreactivity of OSCC may also depend on the degree of cellular differentiation (keratinization) as seen in the study by Nitta et al. 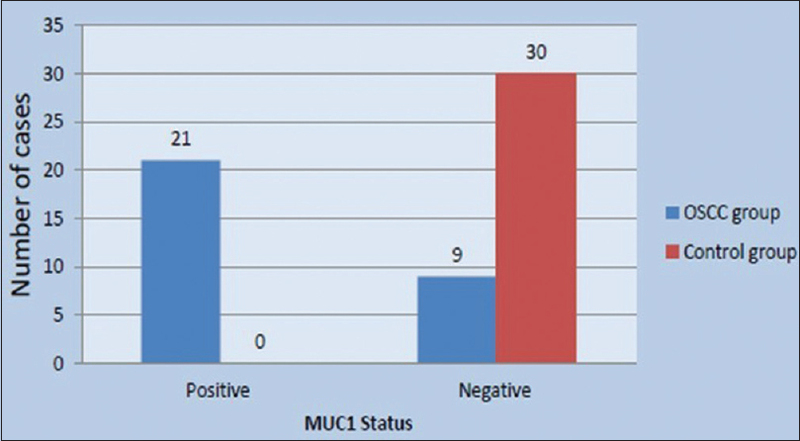 In the present study, out of 30 cases, 9 were negative and 21 were positive for immunoexpression of MUC1. The distribution pattern MUC1 immunopositive cells in 21 OSCC cases were diffuse in 11 cases and focal in 10 cases. This distribution pattern is in accordance with the study by Nitta et al. and Kumar et al. They also reported focal and diffuse pattern of immunostaining in their respective studies. Out of 21 cases, 9 (30%) cases showed mild intensity, 7 (23.33%) cases showed strong intensity and 5 (16.66%) cases showed moderate intensity. The moderate-to-strong cytoplasmic reactivity of MUC1 may be due to the intracellular transport of the DF3 antigen. Membrane glycoproteins are synthesized in the rough endoplasmic reticulum and transported to the Golgi complex. Studies have shown that MUC1 overexpression leads to loss of cell polarity and MUC1 acts as an anti-adhesion molecule. Overexpression of MUC1 on the cell surface reduces cell-cell and cell-extracellular matrix adhesion, probably because the large, elongated and rigid structure of MUC1 interferes with interactions between adhesion molecules and their ligands. In the present study, upregulation of MUC1 immunoexpression was seen in OSCC as compared to NOM. Hence, it can be concluded that MUC1 may play a vital role in the pathogenesis and progression of OSCC. It can also prove to be a useful diagnostic marker for OSCC. However, its usefulness as a marker for invasive/metastatic potential of OSCC and as a prognostic marker warrants further research. 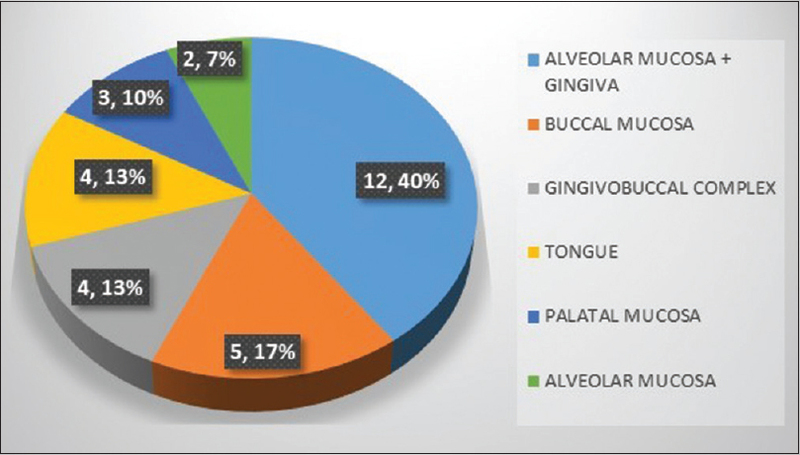 Radhakrishnan R, Shrestha B, Bajracharya D. Oral Cancer – An Overview. In: Ogbureke KU, editor. Oral Cancer. InTech; 2012. Available from: http://www.intechopen.com/books/oral-cancer/oral-cancer-an-overview. [Last accessed on 2017 Mar 16]. Ferlay J, Soerjomataram I, Ervik M, Dikshit R, Eser S, Mathers C, et al. 2012;1.0, Cancer Incidence and Mortality Worldwide: IARC Cancer Base No 11. Lyon, France: International Agency for Research on Cancer; 2013. Available from: http://www.globocan.iarc.fr. [Last accessed on 2016 Jan 08]. Bronchud MH, Foote M, Peters WP, Robinson MO. Molecular markers. In: Principles of Molecular Oncology. Totowa, New Jersey: Humana Press Inc.; 2000. p. 3-6. Kufe DW. Mucins in cancer: Function, prognosis and therapy. Nat Rev Cancer 2009;9:874-85. Kumar MH, Sanjai K, Kumarswamy J, Keshavaiah R, Papaiah L, Divya S, et al. Expression of MUC1 mucin in potentially malignant disorders, oral squamous cell carcinoma and normal oral mucosa: An immunohistochemical study. J Oral Maxillofac Pathol 2016;20:214-8. Barnes L, Eveson JW, Reichart P, Sidransky D. editors. World Health Organization Classification of Tumors: Pathology and Genetics of Head and Neck Tumours. Lyon: IARC Press; 2005. p. 163-5. Sobin LH, Gospodarowichz MK, Wittekind C. International union cancer control. TNM Classification of Malignant Tumours. 7th ed. UK: Wiley – Blackwell; 2009. p. 22-30. Bryne M, Nielsen K, Koppang HS, Dabelsteen E. Reproducibility of two malignancy grading systems with reportedly prognostic value for oral cancer patients. J Oral Pathol Med 1991;20:369-72. Nitta T, Sugihara K, Tsuyama S, Murata F. Immunohistochemical study of MUC1 mucin in premalignant oral lesions and oral squamous cell carcinoma: Association with disease progression, mode of invasion, and lymph node metastasis. Cancer 2000;88:245-54. Itoh T, Yonezawa S, Nomoto M, Ueno K, Kim YS, Sato E, et al. Expression of mucin antigens and lewis X-related antigens in carcinomas and dysplasia of the pharynx and larynx. Pathol Int 1996;46:646-55. Markopoulos AK. Current aspects on oral squamous cell carcinoma. Open Dent J 2012;6:126-30. Williams HK. Molecular pathogenesis of oral squamous carcinoma. Mol Pathol 2000;53:165-72. McGuckin MA, Walsh MD, Hohn BG, Ward BG, Wright RG. Prognostic significance of MUC1 epithelial mucin expression in breast cancer. Hum Pathol 1995;26:432-9. Ikeda Y, Kuwano H, Ikebe M, Baba K, Toh Y, Adachi Y, et al. 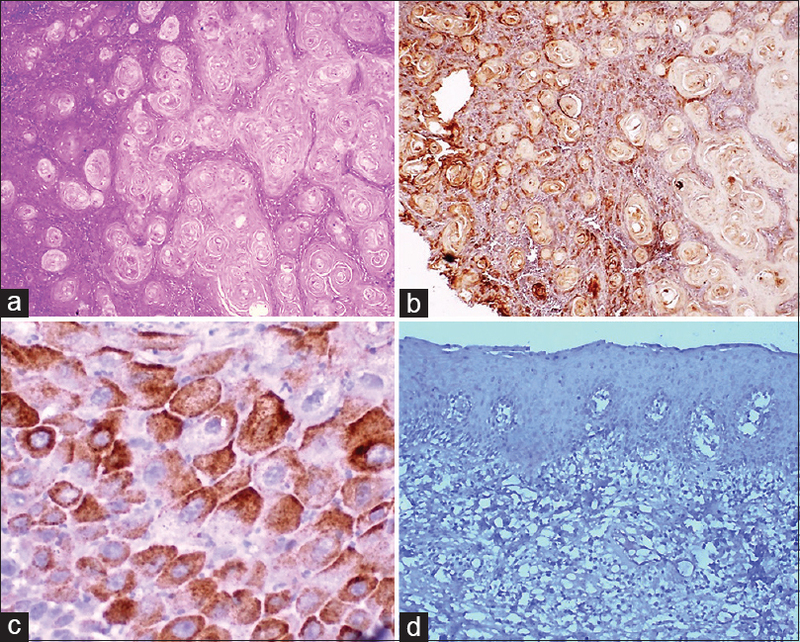 Immunohistochemical detection of CEA, CA19-9, and DF3 in esophageal carcinoma limited to the submucosal layer. J Surg Oncol 1994;56:7-12. Yonezawa S, Sato E. Expression of mucin antigens in human cancers and its relationship with malignancy potential. Pathol Int 1997;47:813-30. Vlad AM, Kettel JC, Alajez NM, Carlos CA, Finn OJ. MUC1 immunobiology: From discovery to clinical applications. Adv Immunol 2004;82:249-93. Gendler SJ, Spicer AP, Lalani EN, Duhig T, Peat N, Burchell J, et al. Structure and biology of a carcinoma-associated mucin, MUC1. Am Rev Respir Dis 1991;144:S42-7. Croce MV, Rabassa ME, Price MR, Segal-Eiras A. MUC1 mucin and carbohydrate associated antigens as tumor markers in head and neck squamous cell carcinoma. Pathol Oncol Res 2001;7:284-91. Hamada T, Nomura M, Kamikawa Y, Yamada N, Batra SK, Yonezawa S, et al. DF3 epitope expression on MUC1 mucin is associated with tumor aggressiveness, subsequent lymph node metastasis, and poor prognosis in patients with oral squamous cell carcinoma. Cancer 2012;118:5251-64.